Who is it for? 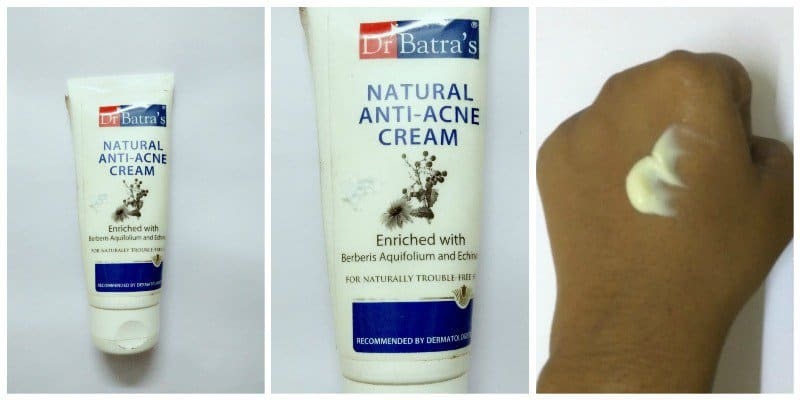 Dr. Batra’s Anti-Acne Cream is a cream for acne. This product is ideal for the severe level of acne also. Gently squeeze the tube and take the required quantity in your palm. Apply it on clean face 2-3 times a day. Massage in a circular motion on the affected areas. This product is packed in an opaque white tube with flap-open cap.An absolutely travel –friendly packaging. The quantity available inside the product is also satisfactory. It has a very mild and pleasing fragrance. A Semi- solid consistency with greasy texture. I suffered from acne for many years and this product worked well on my skin. It transformed my skin into a healthier one. So; it is an all in one cream for acne. It works best with Dr.Batra acne clearing face wash.
What did I like about this product? Suppresses the size of a pimple and prevents the occurrence. Lightens the skin by one shade. Fades away the blemishes due to acne or other reasons. This product contains Tannins that reduces irritation and itching. Berberis Aquifolium also was known as Oregon grape root fights acne and skin irritation. Echinacea provides the soothing effect, curbs infections and provides a healthy skin. It is also a natural deep cleansing agent. Olive leaf extract prevents the skin from aging effect and damages. Nonsticky and doesn’t leave any residue on the skin. What I disliked about this product? It requires more patience for visible results because the frequent application is needed. Sometimes, the nature of this product changes making us assume that it is spoilt. Slightly expensive for the quantity. It is not easily absorbed by the skin and takes a minute for drying. Opaque packaging. So, don’t know how much is left inside. This product is not a permanent solution for acne. In severe cases, acne problems will return when stopped using it. Would you recommend or repurchase this product? Yes. I would recommend this product.